I was recently asked about using back-bevels on a plane blade. Putting a small bevel on the back of the blade effectively increases the angle at which the sharp edge slices the wood. The higher angle causes less (or no) tear-out on tricky or figured hardwoods. One of my favorite planes is a high angle Chinese smoothing plane. The blade is bedded at about 60 degrees and it can tame the wildest grain. The higher the angle of the blade the harder the plane is to push but it is worth it! 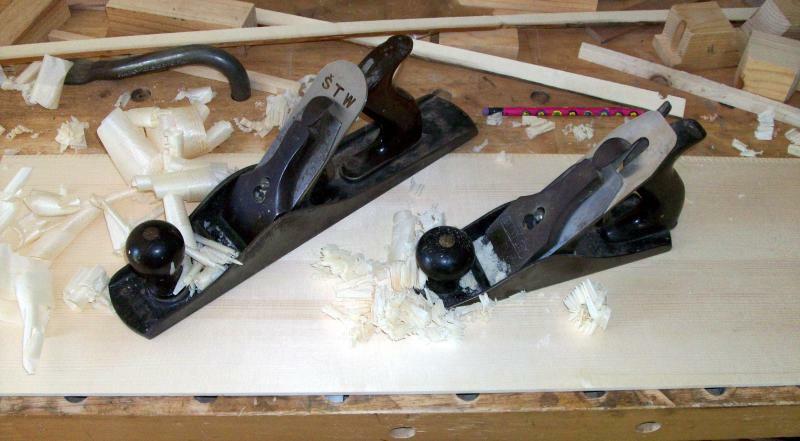 Sometimes the plane of choice is a standard Stanley/Bailey style plane. These pitch the blade at 45 degrees which is good for clear, consistent grain but not so great on figured or tricky wood. A back-bevel can offer many choices of cutting angle on these planes. Today while planing an Adirondack spruce soundboard I noticed that I had a “photo-op” to show the difference in how different pitches of the blade slice the wood. The #5 plane on the left has no back-bevel; it simply cuts at the 45 degree angle the plane was originally designed for. The blade is sharpened with a pronounced camber and the plane is set for a somewhat heavy cut. The #4 plane on the right has a 10 degree back-bevel which causes the blade to cut the wood as if it were pitched at 55 degrees. This plane is set up for final smoothing with a tight mouth and a light cut. Notice how the #5 produces long, smooth curls while the #4 produces crinkled shavings. The higher cutting angle of the #4 breaks the fibers before they tear. The #5 leaves a decent finish but there is some tear-out here and there, especially when the grain reverses. The #4, though producing harsher looking shavings, leaves a fine silky finish. That’s really thoughtful of you. It would be fine with me if you wanted to do that. Either way I appreciate the thought! 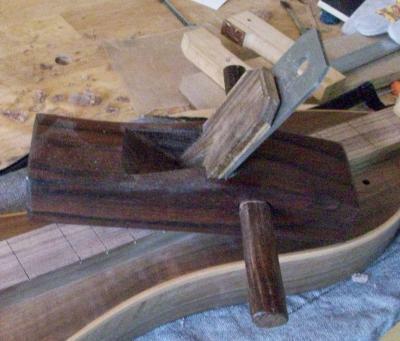 Hey Doug: I imagine you are one of the few (only) person making dulcimers this way. Seems like you could maybe get an article in not just DPN, but how about Fine Woodworking. I’d be happy to recommend you to them with a link to this blog post.